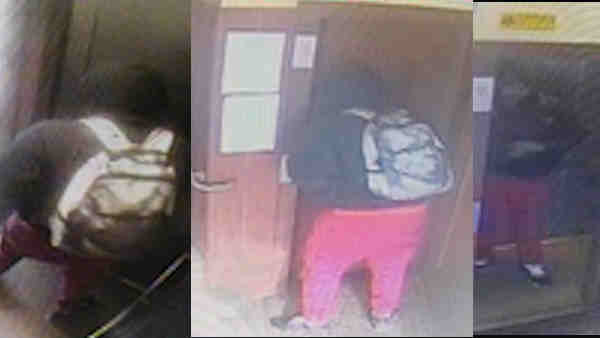 Police are searching for a gunman after a bullet went through a classroom window in Brooklyn. CANARSIE, Brooklyn (WABC) -- Police are searching for a gunman after a bullet went through a classroom window in Brooklyn Tuesday. On Wednesday, the New York City Police Department released new pictures of someone running from the shooting scene. Officials said a man fired four gunshots during an argument with a group outside the city-run Greenwood Houses on Glenwood Road in Canarsie just after 11:30 a.m.
A car on the scene had shattered windows and bullet holes in the side, but one of the shots went through a fourth-floor classroom window at South Shore High School, which runs adjacent to the housing complex. It became lodged in a blackboard. Authorities said 17 students were in the classroom at the time, but none of them was injured. "The NYPD immediately responded to and is investigating a non-school related incident that occurred near the South Shore campus in Brooklyn. Students and staff are safe and there were no injuries. We'll continue working closely with the NYPD to ensure the safety of all school buildings."